I’m a HUGE lingerie lover in SL AND RL. I can’t get enough of it. The way it makes me feel, so confident and yayuh. So yeah, I’m here to show you folks some new sezy thangs at Blacklace. Lots of spring colors, and all so lovely. I’m loving these bold makeups and brows from Glam Affair and they’re exclusively for the Cosmetics Fair. So tp on ova and pick up all the thangs. You guys need to tp on ova to TDR Fusion and pick up these skins from Essences, they are so freaking gorgeous. Tone is light rose and comes with ginger, blonde, brunette and black brows 😀 ALSO, you get cleavage, eyelashes and blush layers ALL FOR 70L$, I can’t. 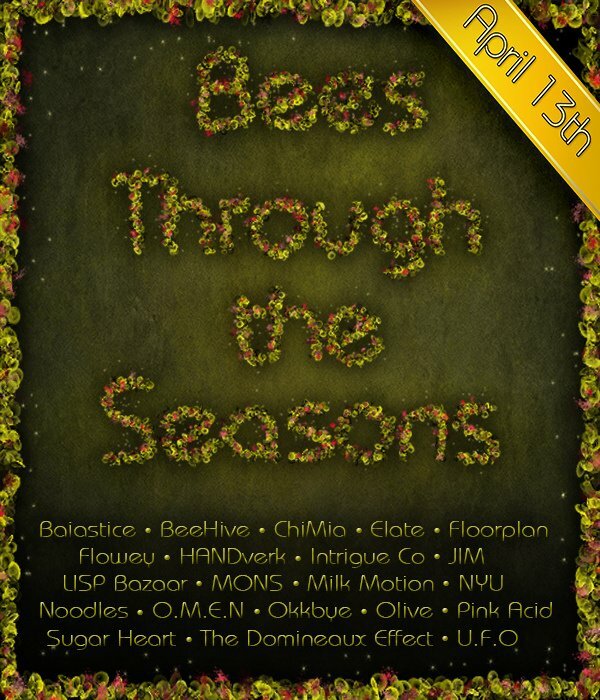 GUYS, Bees Through The Seasons is OPEN NOW. I am sooo freaking excited for you guys to see this place because everything is super cute and these designers and everyone involved have seriously out done themselves. Just gonna show you guys a few outfits I put together. I hope you like them, CAUSE I DO. Yesterday was Autism Awareness Day, and yeah I may be doing my “blue” post a day late.. but HEY, this whole entire month is for autism awareness and I definitely wanted to show my support. Also, we have a new monthly event you guys.. Its called The Box and it started April 1st and there are some pretty cute awesomely awesome thangs you can pick up there. The dress I’m wearing is from C’est la vie and completely adorable, also gonna show you guys some cute poses from Imeka. Guys, I’ve actually done it. I bought zee mesh bewbs. I actually like them when they’re made smaller, and that is just what I’ve done. You don’t always have to have them the size of damn watermelons. Anyways, Glam Affair has 3 gorgeous Zara skins for The Big Bo.obie Show, open now. I’ve been listening to this song ALLLLL FUGGIN’ DAY. Enjoy.